Although, metformin is a drug of the first choice in the treatment of type 2 diabetes mellitus, its molecular action is not fully determined. It is widely accepted that the antihyperglycemic effect of metformin is a result of a decrease in hepatic glucose production, and several cellular targets of the drug have been proposed. The reduction of gluconeogenesis evoked by metformin may be a result of an energy deficit evoked through the inhibition of mitochondrial respiratory chain complex I and/or increased cytosolic redox state and decreased mitochondrial redox state elicited by the inhibition of mitochondrial glycerophosphate dehydrogenase (mGPD). 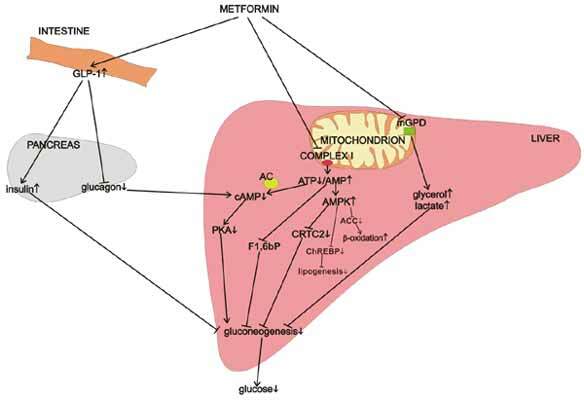 Metformin mediated reduction of hepatic gluconeogenesis was found to be AMP-activated protein kinase (AMPK) dependent and independent, including the inhibition of gluconeogenesis gene expression and allosteric regulation of key gluconeogenesis enzymes. Recently, it was reported that inhibition of mGPD by metformin decreases the level of dihydroxyacetone phosphate and reduces the conversion of lactate to pyruvate, that in consequence diminishes the utilization of glycerol and lactate for gluconeogenesis. The purpose of this paper is to discus molecular mechanisms responsible for the metabolic action of metformin. Metformin, AMP-activated protein kinase, cyclase adenylate, mitochondrial glycerophosphate dehydrogenase, respiratory complex I, gluconeogenesis. Department of Internal Disease, Diabetology and Clinical Pharmacology, Medical University of Lodz, Pomorska 251, 92-213 Lodz, Poland.